This dump is valid to pass Microsoft 70-484. And don’t just memorize the answer, you need to get through understanding of it because the question changed a little in the real exam. The material is to supplement your studies. 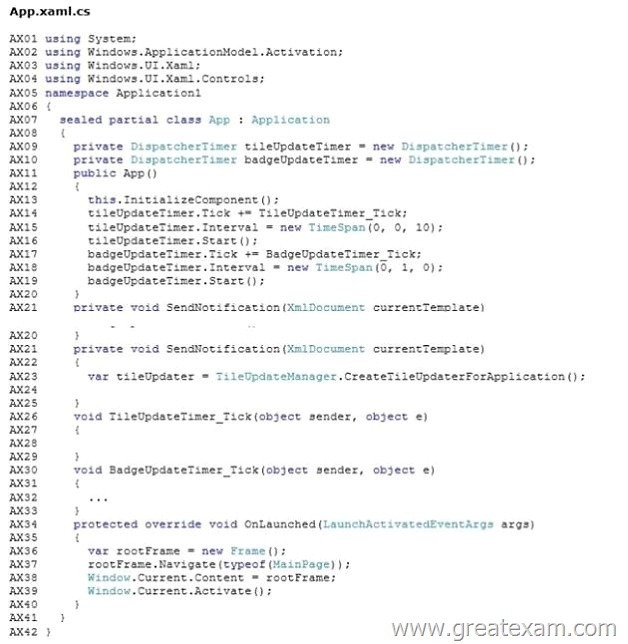 You are developing a Windows Store app by using C# and XAML. The app will allow users to share and rate photos. The app will also provide information to users about photo competitions. The app stores data by using a class that is derived from the DataStoreBase class. The app coordinates content between users by making calls to a centralized RESTful web service. The app has a reminder system that displays toast notifications when a photo competition is almost over. The app gets the competition schedule data from the web service. The app displays a list of images that are available for viewing in a data-bound list box. The image file list stores paths to the image files. The app downloads new images from the web service on a regular basis. – Run the app on a variety of devices, including devices that have limited bandwidth connections. – Share and synchronize high resolution photographs that are greater than 1 MB in size. – Rate each photo on a scale from 1 through 5. – Retain state for each user and each device. – Restore previously saved state each time the app is launched. – Preserve user state and photo edits when switching between this app and other apps. – When the app resumes after a period of suspension, refresh the user interface, tile images, and data with current information from the web service. – Update the image list box as new images are added to the image file list. – Convert the image paths into images when binding the image file list to the list box. – Regularly update the app tile with random images from the user’s collection displayed one at a time. – If the photo has a user rating, the tile must display the average user rating as a badge. – If the photo does not have a rating, the tile must display the Unavailable glyph as a badge. – Update the app tile in real time when the app receives a notification. – Display only the most recent notification on the app tile. The app must display toast notifications to signal the end of a photo competition. – Display toast notifications based on the schedule that is received from the web service. – Display toast notifications for as long as possible. – Display toast notifications regardless of whether the app is running. – When a user clicks a toast notification that indicates the end of the photo competition, the app must display the details of the photo competition that triggered the toast notification. You need to ensure that launching the app displays the required information. The user closes the app through the close gesture or Alt+F4 and takes longer than 10 seconds to activate the app again. Your app can use activation to restore previously saved data in the event that the operating system terminates your app, and subsequently the user re-launches it. The OS may terminate your app after it has been suspended for a number of reasons. The user may manually close your app, or sign out, or the system may be running low on resources. You need to choose the appropriate data binding strategy for the image list box. You need to configure toast notifications for the photo competition. B. Save photographs by calling the SaveDataToLocalStorage() method. C. Save photographs by calling the SaveDataToWebService() method. D. save application state by calling the SaveDataToLocalStorage() method. Retain state for each user and each device. in the App_Resuming event handler. 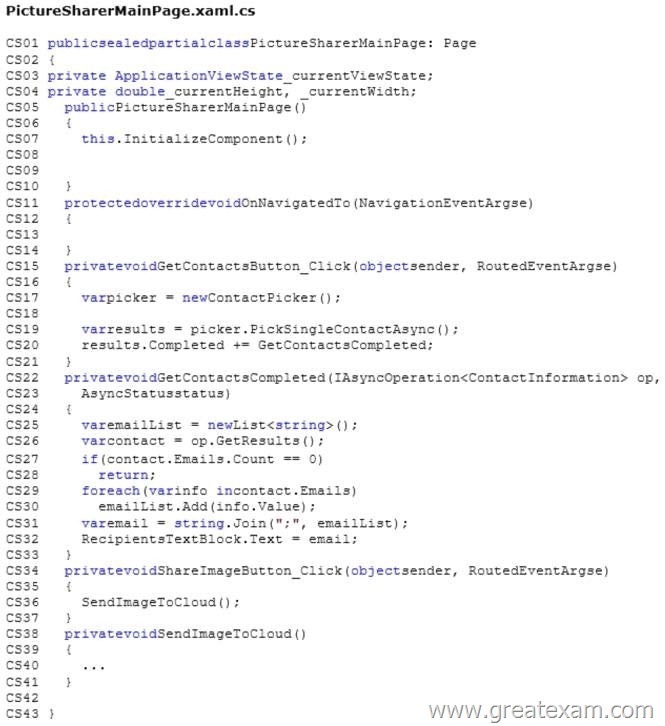 C. Override the OnLaunched event handler. in the OnLaunched event handler when the ActivationKind is Launch. OnLaunched event handler when the ActivationKind is Launch. F. Register the App_Resuming event handler for theResuming event. You need to identify the class to use as the data context for the image list box. You need to meet the requirements when a user clicks the toast notification. Display toast notifications based on the schedule that is received from the web service. Display only the most recent notification on the app tile. A. Save photographs by calling the SaveDataToAzureStorage() method. B. Save application state by calling the SaveDataToLocalStorageQ method. D. Save photographs by calling the SaveDataToWebService() method. E. Save application state by calling the SaveDataToAzureStorage() method. F. Save photographs by calling the SaveDataToLocalStorage() method. You need to update the app tile images. You need to access the remote image data according to the requirements. Which data storage methods should you use? You are developing a Windows Store app named Picture Sharer. The app will allow users to capture, modify, caption, and share pictures. The SharelmageButton and GetContactsButton controls use the same foreground color. The foreground color might change in the future. – Allow users to capture and retrieve pictures, modify pictures by adding a shading effect, and add captions to images. – Support only Landscape and Landscape-flipped orientations. – Ensure that users can select and modify images from the PictureChooserPaqe page. – Ensure that users can change the magnification of the selected image and resize the image by using pinch and stretch gestures. Scaling should be fluid and precisely controlled by the user. The app must be localized for the French Canadian market. – Scroll bars must not be visible. – The CaptionTextBlock and CaptionTextBox controls must appear side by side, without overlapping and on the same line. The CaptionTextBox control should appear to the right of the CaptionTextBlock control. – The ContactPicker object must be filtered to display only email addresses. – Minimize the code that is required to implement optical zoom functionality. 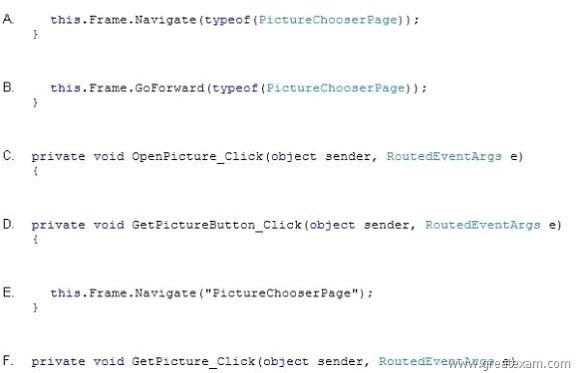 – Handle the Click event of the GetPictureButton control to switch from the current page to the PictureChooserPage page. – After the user selects an image on the PictureChooserPage page, ensure that the app navigates back to the PictureSharerMainPage page. – Track the current screen orientation and page size by updating the _currentViewState, _currentHeight, and _currentWidth fields every time the screen orientation or page size changes. – Create a style named ButtonStyleWhite that inherits all the style settings of the ButtonStyleRed style except the border color; the border color must be white. The ButtonStyleWhite style must automatically update with any changes that are made to the ButtonStyleRed style. – Ensure that the OnNavigatedTo() method updates the current picture when a new picture is selected. – Change the background for the root Grid element to a vertical gradient that transitions from black at the top to maroon at the bottom. Create a resource named GridBackgroundGradientBrush to hold the requested gradient. – When users navigate away from the PictureSharerMainPage page, information that was entered in the CaptionTextBox control is lost. – (D) Handle the Click event of the GetPictureButton control to switch from the current page to the PictureChooserPage page. – (A) After the user selects an image on the PictureChooserPage page, ensure that the app navigates back to the PictureSharerMainPage page. You need to implement the required image magnification and manipulation requirements for selected images. C. Use the ManipulationDeltaRoutedEventArgs.Delta.Scale value to implement optical zoom. D. Add a ManipulationDelta event to the SelectedImage object. E. Add a ManipulationMode attribute to the SelectedImage object and set the attribute to All. 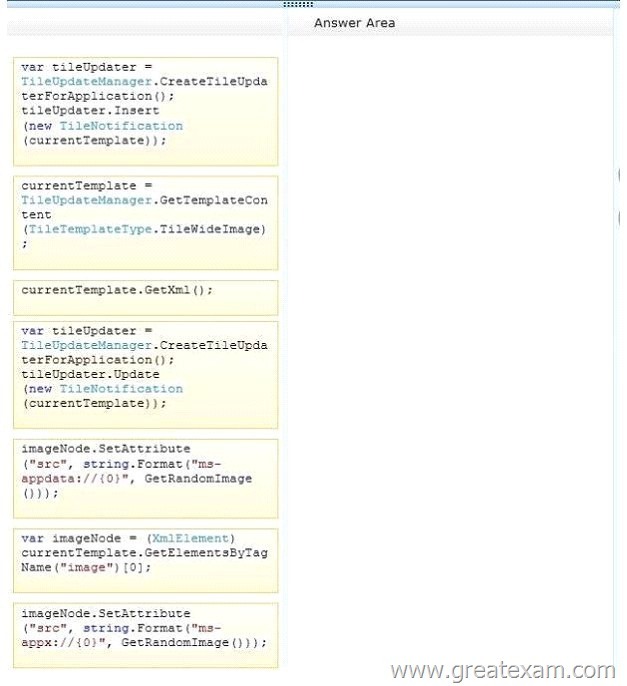 F. Add a ManipulationComplete event to the SelectedImage object. Ensure that users can change the magnification of the selected image and resize the image by using pinch and stretch gestures. Scaling should be fluid and precisely controlled by the user. You need to implement the OnNavigatedTo() method to meet the requirements. 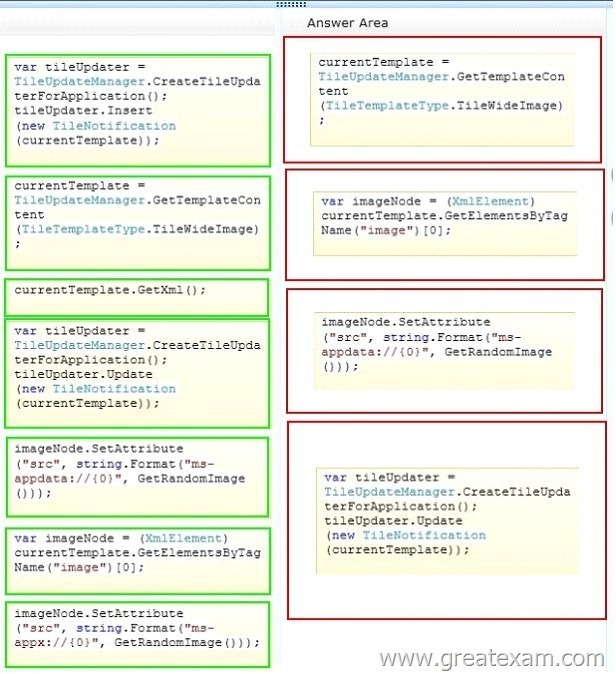 Which code segment should you insert at line CS13? Ensure that the OnNavigatedTo() method updates the current picture when a new picture is selected. A. Add a Uid attribute to any XAML elements that must be localized. B. Create a folder named fr-CA at the root of the project. C. Create a resource file named resources.res. D. Create a resource file named resources.resw. E. Create a folder named es-ES at the root of the project. F. Add a Name attribute to any XAML elements that must be localized. – (A) To localize a certain property of a XAML element you only need to add a x:Uid=”SomeKey” attribute to the element and add the appropriate resource to the .resw file. – (B) The app must be localized for the French Canadian market. – (BD) Example: A French language resource named “Greeting” whose value is ” Bonjour!”. To create the resource file, add a folder named fr-FR to your project, and then add a resource file named Resources.resw to the folder. – In Windows Store apps, you designate the names of localized resource files by creating a folder to store the resources and images of a supported culture. You can then describe the resource by using the culture name (such as “ko-kr”) followed by the default resource name and resource file extension (such as “ko-kr \Resources.resw”). You need to modify the GetContactsCompleted event handler to prevent the exception. Which code segment should you use to replace line CS32? – An exception is being thrown in the GetContactsCompleted event handler when the retrieved email address is assigned to the RecipientsTextBlock control. 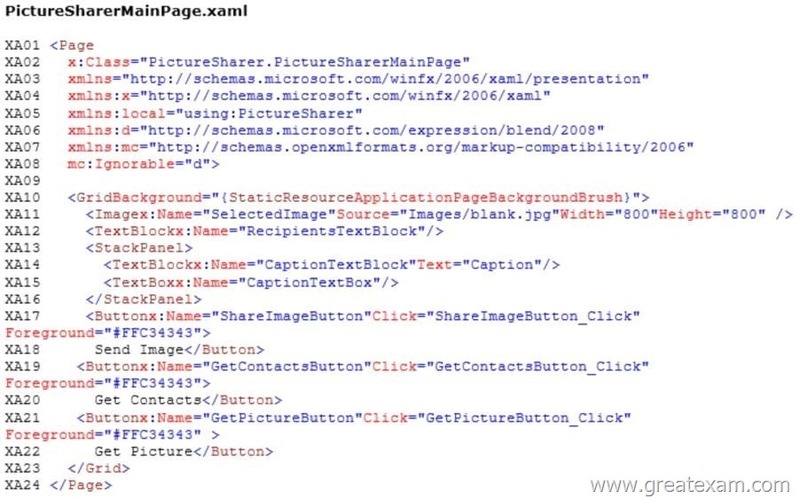 You need to retain the data that is entered in the TextBox control when the user navigates away from the PictureSharerMainPage page. 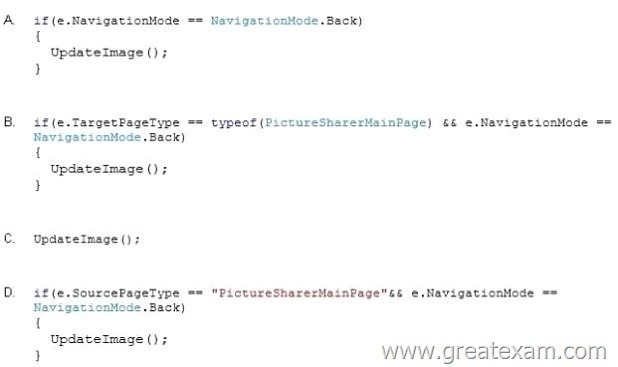 Which code segment should you insert at line CS08? Specifies caching characteristics for a page involved in a navigation. The page is cached and the cached instance is reused for every visit regardless of the cache size for the frame. You need to configure the ContactPicker object. Which code segment should you insert at line CS18? The ContactPicker object must be filtered to display only email addresses. About 90% questions are from this 70-484 dump. One thing you need to pay attention is the questions are rephrased in the real 70-484 exam. And btw selections are jumbled so you must remember the answer itself not the letter of choice.